Sometimes you have to totally geek out. Go out on a limb, or “do something weird because you can”. I did that. Last month I initated contact with the artist of one of my favorite comics that has come out this year. Over the course of this last week him and I bantered back and forth as I allowed him to “talk-shop”. The cover to the pages inside the first issue of The Few was the lone reason why I picked it up during the first few weeks into the year. Twenty-Seventeen had already started proving to be incredibly trying both on a personal level and on a geographic and national level, so seeing something visually captivating that allowed a temporary mental escapism to occur was welcomed. The artwork of this comic captivated my interest and I was instantly consumed by the imaginative storytelling, both with the words and with the artwork. I decided to reach out to Hayden Sherman, the artist for The Few, on Twitter and I asked him if he’d be willing to conduct an informal interview. He obliged, and after a few dozen email correspondences back and forth, what transpired afterward is transcribed below; a candid conversation between @argyleeater and @cleanlined. Sean// It’s very nice of you to take the time to do this, and it’s a pleasure and an honor for me to have this conversation with you. Thank you. 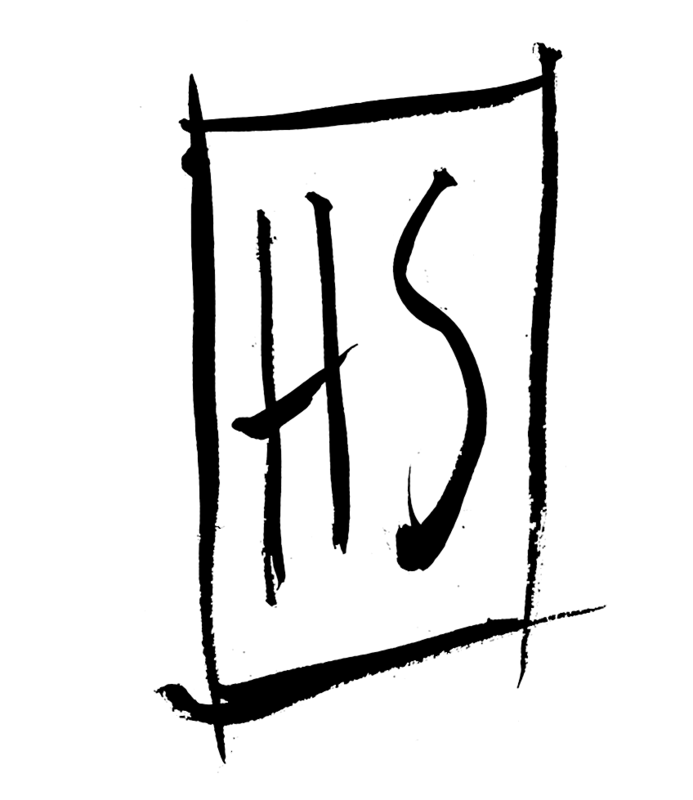 Hayden// Thanks for taking the time to interview me. I’ll answer as best as I can, and hopefully I won’t take too long to get back to you. Sean// Ok, great! So, first off, as a child I loved to draw. I drew everything from Ninja Turtles to Darkwing Duck. I think every kid has some sort of aspiration to one day become an artist. Whether it is Disney or some other vague childlike visualization of the profession, it is the dream of most children to become an artist in some way. How did you make the transition from childhood dream to adult reality? Hayden// Honestly, I don’t know if that transition has happened yet. In many ways it’s still my childhood dream that I carry with me, even when I hold a book with my name on it it doesn’t feel quite like a reality yet. While growing up, drawing was just something I really enjoyed doing. I loved getting to make images of the characters I read stories about (as well as my own characters) and wanted to keep drawing to where my images would look like the ones that I saw in books and comics. Somewhere between then and now I realized that this thing I really enjoyed doing was in fact a “job” that people did for a living! I was probably near the age of 10 when I really started to understand that. But since then, and with the help of many people to steer me in the right direction, I just continued to push. The way I saw it (and still do) was that if I could work hard enough, and push myself, and really learn about this medium that I loved so much, in time I would be able to join in and make comics as well. I’m still learning and pushing, thankfully there’s plenty of room to go and more than enough ground left to be covered. But the dream is something that I’ve carried within me all along. Sean// Who were some of the characters that you enjoyed drawing the most as a kid, and can you describe some of these “characters of your own” that you mention? Have any of them retained their relevance within your mind? Have you given them backstories or any simple plotlines? Hayden// Characters like Batman, Superman and Spider-man made many appearances in my sketchbooks, along with just about anyone from Star Wars. As for my own characters, I haven’t put any of them to use just yet. But I put in little nods to them as background characters in other stories from time to time for fun. I may have to sit down with them again soon though and see if there’s anything worth keeping. You never know! 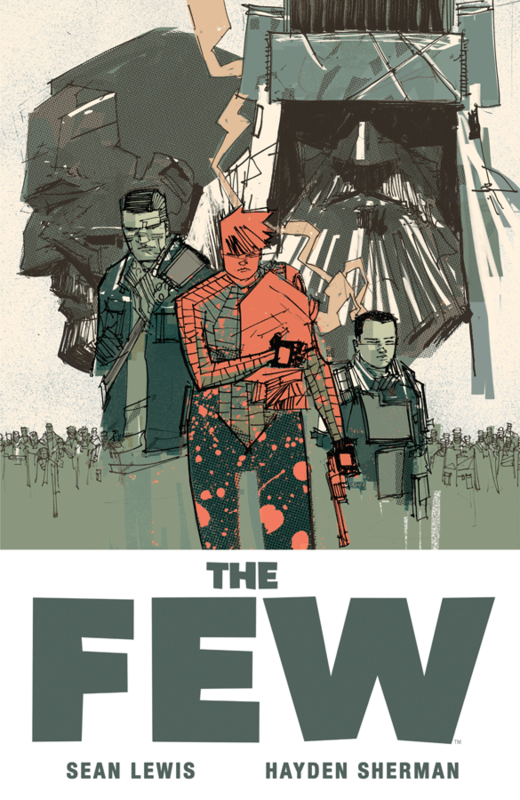 Sean// I know that The Few is not your first collaboration in comics but would you consider it your breakout series? Hayden// I think that’d be fair to say. The Few is definitely the story that’s been with me the longest. Sean Lewis and I started working on it about a year and a half ago and the collected edition only just came out (August 23) yesterday! It’s really been the series where I’ve been able to cut-loose the most…so far anyways. Sean// So then, tell me about your first experiences working on something that was published. How did that work and who did you work with? Hayden// My first experience was on a little collaboration between Marvel and Adobe (the company behind Photoshop and such) that I got involved in during the tail end of my Sophomore year of college. They were putting together a little 10 page Avengers comic to give away for free on the show floor of San Diego Comic Con (SDCC) in 2015. I was selected along with three other students from around the world to make two pages of the comic, and we each focused on a specific Avenger. It was an incredible first experience. I got to draw Sam Wilson Captain America for Marvel, and each of us students got flown out to San Diego for the convention. It was my first SDCC and they let us onto the floor before they were even open for the day. I’ll never forget that. It also introduced me to the two editors who I would later work with during my brief time on Kingpin! Which, Kingpin was my first time seeing my own work on the comic stands, price tag and all, with Punisher on the cover. That got me tearing up pretty quick. I’m very grateful to have gotten to work with everyone that I have all along the way, it’s wonderful knowing that most of the people working in the industry love it just as much as you do. Sean// That is so awesome! Well, The Few has been my first exposure to your work and I’m a big fan already. So tell me, do the pictures come first or do the words? Hayden// In all the collaborations I’ve been involved in, words have come first. The script style varies from writer to writer, but so long as I’m working with someone else the written word starts everything off. From there I get to have fun playing with it and adapting the words into visuals. At the same time, when working on my own I tend to bounce between writing and illustrating. Though, the things I work on by myself have yet to see the light of day. Once I have the time hopefully they’ll get out there! Sean// That’s probably exciting and surreal to even consider the thought of doing your own comic that you’d write and illustrate all on your own. You shared earlier this year on social media your experiences releasing your published work while graduating from college. What was it like to have a limited comic series like The Few published and released while finishing your last semester? Hayden// It was pretty baffling! Having both The Few and John Carter: The End (which I worked on with Dynamite) releasing at the same time through the end of my last year was quite a ride. Funny enough, they both concluded the same month I graduated as well. It was nice getting to tie up those stories along with senior year all within the span of a couple weeks. It allowed me to take a little time off afterward and start working on some new stories. Sean// Forgive me for only being familiar with The Few, but I’m an Image publications fanboy and that’s where I found your work. It seems that your art in The Few and in John Carter: The End is very raw and organic. It could be said that this style of art is making a comeback with people like Jeff Lemire, Matt Kindt, Sean Murphy, and now you. 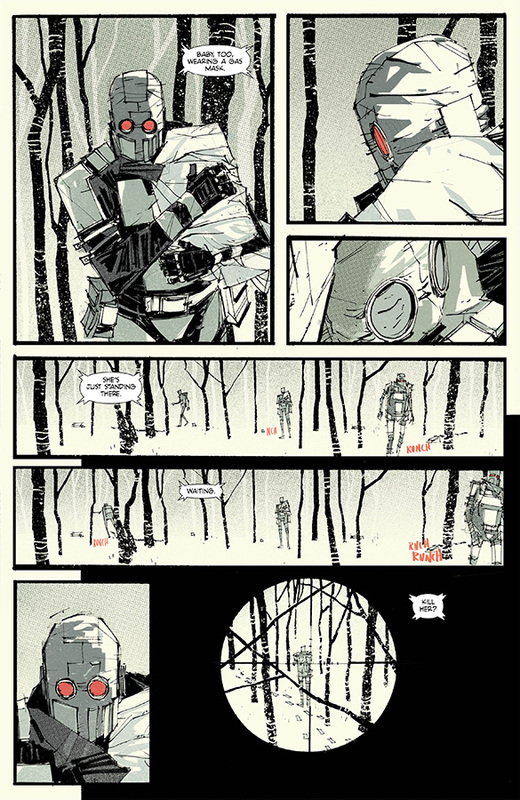 Considering the theory that these organic visuals in comics are overtaking the crisp-lined computer animated style, do you feel that this raw style of art is a lasting trend or a temporary fad? Hayden// Interesting question. I don’t really see it as either. There’s such a vast amount of styles that I find throughout comics that to me it seems that fads and trends rarely exist, at least outside of the mainstream work. Bigger companies definitely lean towards particular styles more often than not (from what I’ve seen) and this can tend to suggest an overall stylistic direction for comics. Like, for example, how in the 90’s everything seemed to be super detailed and cross hatched. 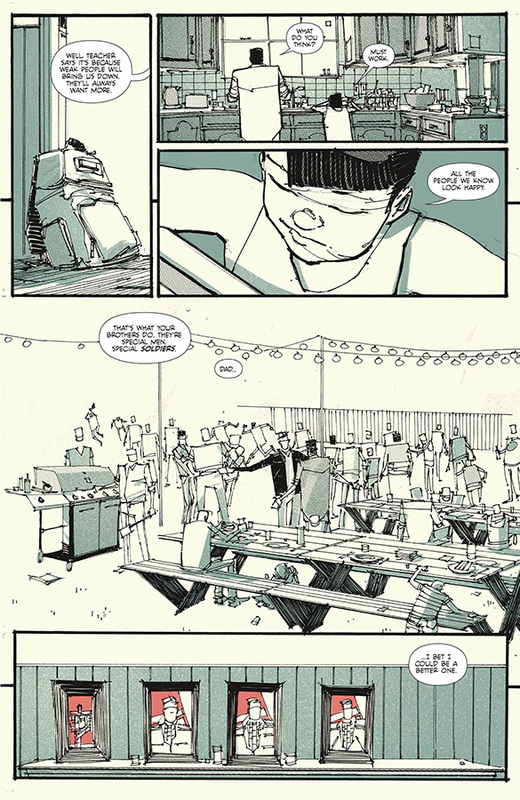 But I feel that now as comics continue to expand, particularly with companies like Image which are all about the creators making whatever work they like, the styles begin to feel much more independent. They’re certainly linked by influences and common inspirations here and there, but I think what we’re really seeing now is the ability of artists to express themselves through comics alongside an audience that wants to see those varying forms of expression. So the increase of these artists with more loose styles feels a bit more like an acceptance to me than a fad. And I’m very glad to see it, the art that I generally enjoy best, whether in comics or elsewhere, tends to be the sort where I can really feel the artist’s hand in it. So that’s something I always want to bring to my work, regardless what style that may result in. Sean// I like your perspective of an expanding common acceptance. That speaks highly of the art medium, and of comics overall. Similarly, what are your views toward the digital format of reading otherwise printed comics? Or with strictly digital comics in general? Do you see it as helping or taking away parts of the experience? Hayden// I think that will really depend on who’s reading. I’m all in for print comics. I love the paper, I love the physical act of the page turn and find something satisfying in owning a physical book. But for people who simply want the story and don’t want to lose shelf space, then I can’t complain. I’ll always be happy so long as comics are being made and people are reading them! 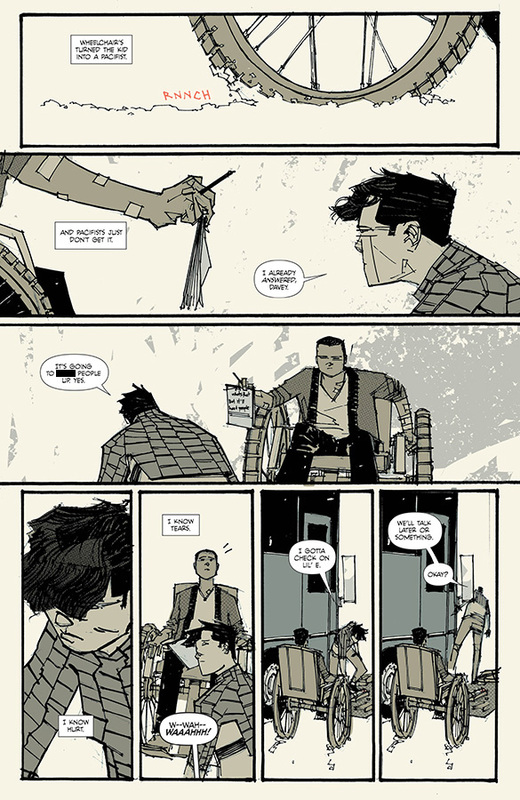 (Speaking of which, there are some really cool artists doing animated web comics and such that are very striking, that’s become it’s own thing really.) That being said, I find reading a printed comic to be like seeing a film in a theater, there’s something unique about the presentation, and the way you have to go out and get it, that draws me in. At the same time, I’m also finding my comics put up for free online in ways that are not legal and definitely not okay with me. That’s no good, and I really hope that no one will read my work (or any creator’s work) through those platforms. If you want it digitally, then awesome! So long as you pay the price tag. Sean// Interesting that you mention the illegal aspect of obtaining comics. I believe that outlets such as Amazon and buying through publisher’s direct website you get the sale credit, correct? As for things such as eBay where it is more of a glorified digital yard sale, how do you tackle that avenue, if at all? True, Ebay may not be as popular of a buying market as it once was but it still is to a certain degree. Hayden// As far as I’m aware that’s the way it goes, recieving payment by way of Amazon and direct purchases. Those ought to be fair and safe ways to get your hands on comics. For things like Ebay I guess I look at it like a used book store. I’m assuming that the book is being resold after having been purchased, which would bring some money back my way at some point at least. So long as some money’s being exchanged that leads back to the creators on some level, sounds good to me. Any of that beats digging it up for free online. Sean// So let’s focus on your latest piece of work, The Few. It takes on large thematic elements that suggest a rather pessimistic version of the future of what we are now seeing happen in America. Were current events an inspiration to the story, or was it a mere fascination with the post-apocalyptic subgenre? Hayden// That’s a question that Sean would be able to answer best. He’s the one who thought up this plot and these characters and happened to invite me in to join him in telling the story. But I can say that current events definitely had weight in the way the story was told. Especially issues 4 through 6, which came about more recently. Both of us greatly enjoy the post-apocalyptic setting, it’s just a naturally interesting thing to imagine, I feel. But what really captivated Sean and I was connecting the typical idea of “post-apocolypse” with the events unfolding around us. What if this strife that we see continues unchecked? What if we don’t learn from these mistakes? Post-apocolypse and dystopias are seen in fiction as often as they are in part because of their strangeness, but historically the vast amount of dystopian tales are meant as warnings. They work as a means of projecting our current ailments into the future to imagine a world where our present conflicts have overtaken us, in hopes that people will be inspired to make a change in the world now. So the setting really made sense for the story Sean had in mind. Sean// Well then I guess I’ll have to chat with Sean then too [ha!] to get the overall intent of the plot. While we’re on the topic of post-apocalyptic and dystopian fiction, do you have any novels that come from that sub-genre of sci-fi that you always keep visible on your bookshelf? Hayden// The top two that I keep visible are Grendel: War Child and Batman: Year 100. Those are two exceptional books, and both in very different ways. War Child is more of a sprawling adventure through a sort of dystopian world, whereas Year 100 is more focused on the city and its government corruption. Both handle the “dystopian” air in really great ways though, tilting things ever so slightly from what we’re used to, to where they look strange and new. Good stuff. Sean// What are your feelings toward the current trend to rush comics and books into a version formatted for screen? Recently, from a fan’s perspective, it seems that there is a vast amount of written fiction being adapted for tv and film which has maybe contributed to the flooded market. Hayden// I think screen adaptations are fun here and there. The only thing I’m not fond of is when a screen adaptation is perceived as “validating” another art form (in this case comics). When I’m working on a book I’m only concerned with the book. Nothing else beyond that matters to me. But if someone decides they want to adapt it, then I’d be interested to hear their take. So long as whoever atempts to adapt a story respects the original work then I think a film or tv show version can be very compelling. With that in mind though, I can’t really say if any comics creators are working with the soul intention of pitching books to movie studios. Some might very well be. But as far as I’m concerned, my focus will always be on the comic itself. There are so many things that comics can do that screens just can’t. And I intend to explore it all. Sean// I only ask that because you hear of works like Scott Snyder’s AD and Jeff Lemire’s Descender get picked up for movie rights before they are even finished releasing the publications. It just makes me question certain aspects of artistic integrity, but I completely agree with your take on the subject. So, tell me, who was your favorite superhero growing up, and what mainstream character would you jump at the opportunity to draw in an ongoing series? Hayden// Batman. All the way. I would jump at any chance to draw a Batman book. Without that character I wouldn’t have come to comics to begin with! Actually, speaking of movie adaptations, my experience with Batman and entering into comics is a big part of my general support for books being brought to the screen. My first introduction to Batman (outside of the toys) was through the 90’s Batman films. I absolutely loved (and continue to love) Batman Forever and Batman and Robin in particular. Those films were made in such a child friendly way and completely captured my imagination to where I could approach them and be brought into the comics by way of them. Without those movies I don’t know when I would’ve picked up a comic! So I tend to view any sort of adaptation as a commercial or preview for the original material. But yeah, Batman all the way. Sean// That is such an awesome memory to have about yourself! I view the first superhero in one’s youth in the same fashion as I do the first album I hear of a band I enjoy, and by that I mean that they purpose as the foundation for your appreciation of that particular piece or figure of art. For me it was Spider-Man. It wasn’t until I became a teenager that Batman became my preferred superhero to read about or watch so I can completely relate to your sentiments. Although, we will need to agree to disagree on which Batman film adaptation from the 90’s is best because I tend to prefer Michael Keaton’s Batman over Val Kilmer or George Clooney’s in a heartbeat! HAHA! Now, as a newcomer to the comic industry does anything about it intimate you? Hayden// Haha no worries there, now I go more for Christian Bale myself. As for the industry, the most intimidating thing for me is probably the day an issue releases. Every new comic book day there’s so many books released, so you just cross your fingers and hope your work finds its place and that people receive it well enough. Oddly, I don’t really think about that while I’m making the book though. When I’m still drawing it I’m just focused on what I think works best. But once it’s out in the world that part of me kicks in that’s curious how people will respond to it. It’s fun getting to see people reading stores that I work on, and I’m incredibly thankful for the response to The Few. But that release day is the most intimidating part of it that comes to mind. Sean// Imagine a hypothetical release day, who is your dream collaboration team for something that you would get in line early or pay money in advance to read? Hayden// Oh man. Okay, I don’t know who I’d want to color it, but if there was some way for Matt Wagner to write a book to be illustrated by Jorge Zaffino I’d be in line way early. Unfortunately we lost Zaffino far too soon. But that’d be something. Sean// I’m not very familiar with those names, but now you’ve given me a bit of homework to do. Now, if you were given an opportunity to draw for anyone in the industry today, who would you stop everything to draw a comic series for? Hayden// …hmmm. I’ll take that as meaning companies. Right now I’d nearly drop it all to draw a book for Dark Horse. I mean… I can’t actually drop it all haha. But Dark Horse would be fantastic, I find myself reading a lot of their material lately. Hayden// Hahaha no worries. I mean, if I’m to be honest then I’ll start sounding like one of those actors giving an Oscar speech, where they keep saying names until they’re played off the stage! But for right now I’ll just name one guy, because I just finished a couple of his books (including Six Gun Gorilla) so I’d say Simon Spurrier. The worlds in his books are crazy and fun and fearless, I’d be plenty happy to partner up with him on something. Sean// Speaking of what you like to read, do you have a pull list at your local comic shop? If yes, what’s on it? Hayden// Ah…I’m actually in the middle of moving right now, so I’ve got to find an all new local shop in Boston. New books I’m reading right now though are: Extremity, Southern Bastards, and Detective Comics. I’ve got a large stack of need-to-read trades on my shelf as well. Finally getting to read books like The Spire, which is an awesome awesome comic if I might add. Sean// I love Southern Bastards! I haven’t read it in awhile though, and I’m quite behind on it. And I might add that your list is much more neat & concise than mine is. I’m all over the place and I cannot keep up with the titles I have stacked up in my shelf to read as they come out. I’m a purist and I try to read the ones I really enjoy before the trade comes out. Often, though, life gets in the way (and by no means is that a complaint!). Now allow me to speak in a hypothetical again: If this comic thing doesn’t work out for ya (ha!) where do you see yourself headed? Do you have any plan B alternate futures you’ve considered? Hayden// No plan B. I have other forms of illustration that I enjoy, like book covers, journalism, spot illustration, story books, and so forth. But wouldn’t consider them plan B’s. Regardless whether or not I’m getting paid for it I’ll continue making comics, so that’s the plan haha. If I come to a point where I can’t rely on comics for income then I’ll spread out and continue drawing in other forms on my own time. Either way, the comics will always be getting made. Sean// Got it. You seem to have, as they say, all your ducks in a row. But let’s humor my “plan-A” segregation of thought, do you have any upcoming projects lined up that you’d be willing to talk about? Hayden// Man oh man I want to talk about them! But I’m waiting on anouncements still *sigh*. What I can say is that there are three books, and that one of them is another collaboration with Sean Lewis called Thumbs! But that’s about all I’m at liberty to say haha. Word should be coming soon though! Sean// Hahahah! That literally made me lol! That probably means that you aren’t at liberty to answer this next question either: any intentions to revisit The Few for a sequel? Hayden// Sean and I have definitely talked about it. There’s a possibility. We both had a lot of fun working on the six issues, so we’re very curious to see what another six could look like. But we’re gonna keep kicking that idea around a little longer before making the decision. Sean// Alright Hayden, thanks so much for the interview. It’s been a real pleasure. One last thing before I let you go. Do you have any inspirational advice or lasting comments for any kid out there who may end up reading this? I have an 8 year old boy and a 6 year old girl who love to draw and they are aware that I have been having this conversation with you. I’m sure anything that you say regarding this topic would go a lot further than anything I ever could. Hayden// The pleasure’s all mine, thank you for taking the time! And absolutely, the best advice I’ve ever been given that I could pass on is to have fun. Art is a lot of things, and can be hard work more often than not it seems, but never forget to have fun. Experiment, play, do something weird because you can, and keep making art. If you’re enjoying what you’re doing, then you can’t go wrong. I hope your little ones will have plenty of fun!